I grew up in Pell City, Alabama, a no-nothing on the way from Birmingham to Atlanta. We lived in a little wood house three blocks from where Dad worked — for his in-laws. He ran their grocery store while they ran the only motel in town, the General Lee. Two things I remember about that time. One is my swing in the backyard. The second is the butcher at the grocery store. He was this enormous black guy who absolutely loved me. I didn’t have a babysitter, so Mom brought me over mid morning. John had cleaned off his gigantic butcher block and would throw me up there and give me a backrub until I fell asleep. He’d then put me on potato sacks, where I took my nap. Mom helped with the motel — bookkeeping, primarily. We moved to Ft. Pierce, Florida, and he planted a bunch of orange trees. In an exceedingly dry summer in year two, guess what caught on fire? Turned our orange grove into charcoal! Dad decided to buy a franchise in One-Hour Martinizing dry cleaners, and we moved to the “big city” of Montgomery, Alabama. My parents always made lemonade out of lemons. It was amazing. I grew up during the lead-in to the Civil Rights Movement. My father, being the flaming Yankee he was and an immigrant, basically, himself, had a real hard time understanding this discrimination business. Dad had more than a few run-ins with the Ku Klux Klan. We had a cross burned in our front yard. Death threats. I was old enough to be proud of my father. The first child I ever ran into with heart disease lived down the street and played football with us. He’d been operated on by Dr. John Kirklin, who became a world-famous heart surgeon. He’s the guy I would end up training under years later. But at that time, medicine was nowhere on my radar. I wanted to be a professional football player. During college, three different advisers sat me down and said, “You ought to go to medical school.” I always said, “I don’t want to be a doctor; I want to do science.” So I got a double major in biology and chemistry and was accepted into graduate school at the University of Alabama at Birmingham in the master’s/Ph.D. program in biochemistry. My mentor there said to me, “You’d be better off going to medical school than being a science researcher.” So I called my mom! (laughs) She said, “When are you signing up?” The next year, my studies involved doing research for Dr. Kirklin’s cardiac surgical program. I realized that this was what I wanted to do. During my cardiac surgery residency, I saw so many kids from Third World countries coming in needing heart repair surgery. There was one particular child — a 12-year-old Nigerian girl — who affected me seriously. I diagnosed her with a condition I wasn’t sure could be fixed. We performed the operation. It made her feel better and look better, but it didn’t change the length of her life. I told the family, “You came over here expecting a Cadillac, and you got a Yugo. I don’t know how long this repair is going to work, but probably not more than 10 years.” To my astonishment, the family was extremely appreciative and thanked me profusely for what I’d done. That little girl was going to die within 10 years. How could they be thankful? I lost it. That night, I started having nightmares about that little girl. Six weeks, every night. What bothered me so much was that if she had been properly diagnosed and cared for at the proper age, she wouldn’t be given this death sentence. I told her I didn’t think she would live to see her 21st birthday. She beat me — by two weeks. Anyway, everyone could tell I wasn’t myself anymore. I was mad; I wasn’t joking in the operating room. Two colleagues finally said, “It might help if you go to a Third World country and give away some of your time.” I made my first trip to Colombia in 1991. I never had another nightmare. I made more trips. I also realized that when we brought doctors here from overseas to train, we were training them at top-flight facilities and then returning them to perform surgery in a dog kennel, basically. What should we do? 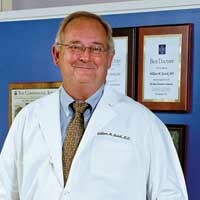 I took the Memphis job at the University of Tennessee in 1993 because of two things: I Iiked the chief of cardiac surgery, and UT would provide me the opportunity to travel and better develop this program of both sending cardiac teams abroad to do heart repair and educating doctors overseas. The International Children’s Heart Foundation was founded in 1994. When I hold a child’s heart in my hands I experience an extremely scary, humbling, and challenging series of thoughts. Scary, because that child might die. Humbling, in that God gave me the ability to do this. Challenging, because we want to save every child no matter how bad the defect is. The most valuable lesson I was taught is to learn everything you possibly can; you’ll never know when you’ll need it. The one person I’d like to meet is someone I’d have to bring him back from the dead. Richard Lillehei, arguably the grandfather of pediatric open-heart surgery. I’ve met the Dalai Lama; presidents of the United States; kings, queens, and princesses; the secretary general of the United Nations; cardinals, muftis — I’ve had a very special life. But being able to sit and talk with one of the pioneers of pediatric heart surgery, that is something I’d want to do. From my father, I got my Russian temperament, my tenacity, and my persistence. If I could do one thing over I would have spent more time with the Dalai Lama. He was one of the speakers at the Hilton Foundation Humanitarian Award luncheon. My flight had been delayed, and by the time I arrived, my name card had been shifted to a back table. As I was listening to the presentation, a door about five feet from me opened. Who walked through but the Dalai Lama with all his entourage. We looked right into each other’s eyes. Instead of walking up to the dais, he came over, shook my hand, and said, “You’re something special,” then walked away. I sat there flabbergasted. I paid a personal price when I committed to lead this life of service above self. I’m always mistrustful of the statement, “Don’t worry! We’ll take care of it!” especially when it’s spoken with an accent I don’t understand! Oh, my God, how many times have I heard that! The time I was most frightened I could say it was being bombed by NATO in Belgrade, but I think it was when I was four and a half years old. I was in a drainage culvert in Ft. Pierce, Florida, with my buddies playing with our soldiers when an alligator came around the corner! Scared the bejesus out of me! To keep my own heart from breaking I compartmentalize the losses. There’s a place within my psyche where I can segregate loss. You can’t be a pediatric heart surgeon and realistically expect 100 percent perfection in your work. In fact, it is psychotic to think you’re God and nothing tragic is ever going to happen. You have to be able to put it somewhere that does not incapacitate you from what you need to do. If you cannot compartmentalize the emotions associated with the loss of a child somewhere where it will not drive you insane for the rest of your life, you don’t need to be a pediatric heart surgeon. I’m most apt to cry when I see a really sentimental, gushy movie. Really! In the 15 years since founding the International Children’s Heart Foundation we have made 200 trips and repaired 4,000 hearts. The worst place I’ve had to operate was Tashkent, Uzbekistan. You know the lab where Boris Karloff’s Frankenstein was created? Similar conditions. Ancient equipment, unclean operating rooms, dangerous power supplies. There was a bypass machine — unplugged — sitting on a counter. Sitting on the floor next to the machine was a pair of heavy rubber gloves and a pair of rubber boots. Our perfusionist went to plug in the bypass machine. Simultaneously, six Uzbeks screamed, “NYET! Put on gloves! Put on boots!” So he did, and when he plugged in the machine, sparks flew. Unreal. The second worst place was Enugu, Nigeria. In Enugu, the power goes out three or four times a day. There are no windows in the operating room, which is dead center in the middle of a building. Pitch black when the power goes off. The first time that happened, we were in the middle of a complicated case. I had stopped the heart, so there was no blood flow going to it — like having a heart attack. But I can’t see anything! I said, “Drop the flow and let me find the clamp!” I’m patting around trying to find it. “Okay, the clamp is off! The heart’s going to get some blood back, but keep it cold because I don’t want the heart beating!” I turned to where I thought the anesthesiologists would be. “Would one of you feel your way out of the room and find a flashlight in the ICU?” And we finished the operation by flashlight. While in medical school I diagnosed my father’s cancer. Christmas holidays. We’re watching a football game on television, and my dad keeps getting up and fooling with the controls. Finally, I said, “What are you doing?” He said, “Something is wrong with this television. There’s no bottom half to the screen, can’t you see that?” I thought he had a retrobulbar melanoma. Unfortunately, I was right about that, but I missed the big picture. He also ended up with renal cell carcinoma — kidney cancer. He died about four and a half months later. From my mother, I got all the soft things in my life: my concern for children regardless of where they are in the world; my deep desire to repair these children around the world; and I suppose my “Dixie-crat” mentality on politics. Before I die I would like to take my five children to the birthplace of civilization. Now, there’d be an argument about whether we should go to Iraq or Egypt! The world’s greatest job is this one. I’ll never forget … Boy, there are a lot of “never forgets”! I’ll never forget the fear I had following the birth of my son, Nicholas. He went through a hard, 12-hour labor that ended with a C-section. When they finally pulled him out, the child of a heart surgeon was blue. Most people don’t know that after I gave up the idea of being a professional athlete, I decided to go to school for what I love, which is the ocean. Marine biologist. I loved what I was doing, but my body didn’t like it. After I ruptured my eardrums bilaterally twice on dives, the professor pulled me aside. “You can still be a marine biologist, but you’ll have to sit at a desk or wade in the tidal pools.” I shifted out of marine biology. I have never been able to refuse a request to help a country in need. I want to be remembered by my wife and my kids as a good father and husband, despite my choice of careers. My final 2 cents … More children in the world die every year from heart disease than AIDS, but nobody knows it. Yet every Hollywood mogul, every Hollywood star, everybody who wants to be on the right side of the political fence — it’s all about kids with AIDS and throwing unbelievable amounts of money at it to achieve minimal results. We have a very correctible problem, and it costs only $2,000 to save the life of a child.